What Type of Humidifier is Best for Babies? Humidifier is one of the most popular picks when it comes to decorating a newborn nursery. It contributes a lot to create a healthy and germs-free environment in the newborn nursery if you can use a humidifier wisely. Anyway, if you are one of those fellow parents planning to buy a humidifier for your newborn nursery yet not sure what type of humidifier is best for babies, this Humidifier Geek Baby Humidifier Buying Guide is exclusively for you. So, let’s get started without further due! A humidifier is a small device works to add moisture to the air of a particular room or to the entire house. It is used in places that are excessively cold and dry to get rid of cold flues as well as other syndromes. It ensures a healthy level of humidity in the room and provides with several other benefits as well. Humidifiers work by converting the water stored in it into steam or mist. It creates a comfortable warmth and misty air in the entire room which is required during the winter. Humidifiers, first of all, prevent dryness from the air. Besides, it helps to treat cold allergy, flu, cold, cough, asthma, prevents germs, dry skin issues, and cracked heels etc. Most importantly, it creates a healthy living environment inside the room which ensures a sound sleep throughout the night. Warm mist humidifier contains water in an attached container with it. As you switch on, the machine starts to vaporize the water and turns it into mist to prevent dryness. Unlike the earlier one, this humidifier is comparatively silent. But, its heating element needs more energy to vaporize the water. The cleaning procedure is also quite hard but it works really well to make you feel comfortable. The cool mist humidifier is generally suggested by the pediatricians for your baby’s room. It ensures safety and child-friendliness while a warm mist humidifier generates heat to vapor the water which may burn your children if they get closer. One most notable thing regarding cool mist humidifier is- it is a bit noisy compared to the other ones. But, it is very easy to clean in comparison with others. Besides, it also requires less energy. The ultrasonic humidifier is a type of humidifier that works in high frequency. It produces strong sound vibrations to create mist. It is soundless and does not require much energy. A light greyish dust may appear while the humidifier is on as there is not any filter to absorb the deposits. It is safe because it doesn’t store water in it. However, as it does not require to boil the water, chances are there to get affected by bacteria if you don’t maintain the humidifier properly. So, it is recommended that you clean it very often to get rid of bacteria. Unlike the previous one, an evaporative humidifier does not require cleaning very often. They stay germ-free for a longer period of time. It is expensive but is a great option indeed. It includes a fan and a wick filter to keep the air moist. The fan is used to turn the water into vapor which is stored in the reservoir. It lasts long and covers a large area as well. 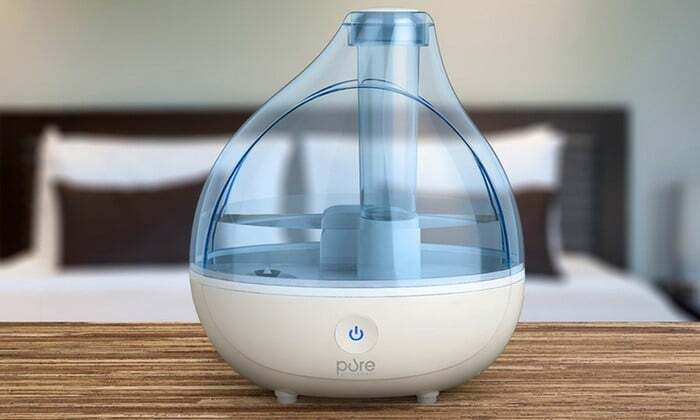 By the time you scrolled down to here in Baby Humidifier Buying Guide, we expect that you read between the lines and came to realize which one would be the best for your newborn nursery. However, considering all these things as stated above, we can say that it would be a wise decision to choose a cool mist humidifier for your baby taking the safety as the first priority. Plus, it is budget friendly, easy to clean and maintain after all. « Do you Know what happens due to Uncomfortable Sleep?